I don’t know about you, but one of my favorite things to do in the Summer is to sit by the fire and make S’mores with my kids. The problem is that it doesn’t always fit into my healthy eating plan. Instead of feeling deprived (and Hangry!) 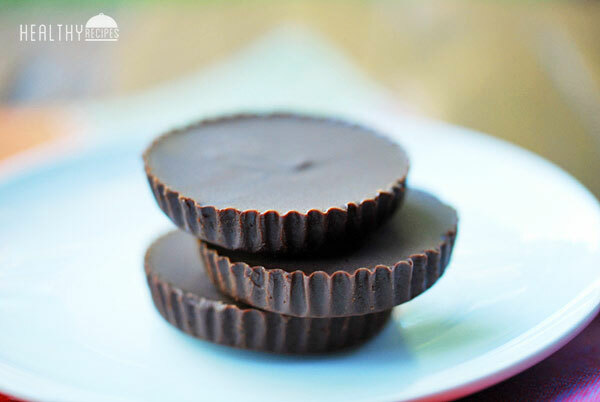 I searched for alternative solutions to my cravings and came up with this life-saver. It really does taste like Summer. 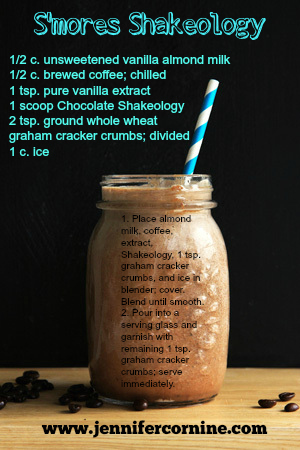 (If you haven’t given Chocolate Shakeology a try and would like to- just give me a shout! Happy Summer! Categories: Nutrition | Tags: Beachbody, diet, healthy, Meal Replacement, s'mores, Shakeology, smoothie, summer, Weight Loss | Permalink. Fight Human Trafficking & Get Healthy this May! Join me in getting healthy this month for a great cause! For the remainder of this week Carl Daikeler, CEO of Beachbody has decided to donate $10 of every 21 Day Fix Challenge Pack to the International Justice Mission in order to combat human trafficking. IJM is an organization close to the hearts of Beachbody’s coaches and one that we are proud to support. With 21 Day Fix, losing weight has never been simpler—or faster! Anyone can have success with this simple program. It’s sure to bring you amazing opportunities for expanding your customer base, so here are some key points to remember. What makes 21 Day Fix unique? • The Eating Plan shows you how to use the portion-control containers • Simply put your choice of food in the color-coded container—if it fits, you can eat it! • Do one 30-minute workout per day according to the Fitness Guide • Follow the simple plan, and you can lose up to 15 pounds in 21 days. I hope that you will join me and fill out this challenge group application for more information. Categories: Beachbody Challenge | Tags: 21 Day Fix, 21 Day Fix Extreme, Beachbody, cardiovascular health, Challenge Group, diabetes, diet, human trafficking, IJM, International Justice Mission, Weight Loss, workout, workout for a cause | Permalink. Food dollars are hard to come by some weeks and I HATE to spend on things that I can make at home for less money and more health benefits. Cereal is one of those things. I do not purchase cereal with loads of added sugar or cute characters. My family knows that if they say to me “Hey, we are out of cereal!”, then I will surely, grudgingly return with generic shredded wheat. AND I will grumble about it. Through Divine Intervention, my current workout love suggests Power Granola as a great breakfast. The macro balance is quite different with this program and has me deviating from the standard egg whites and oats of my past programs. 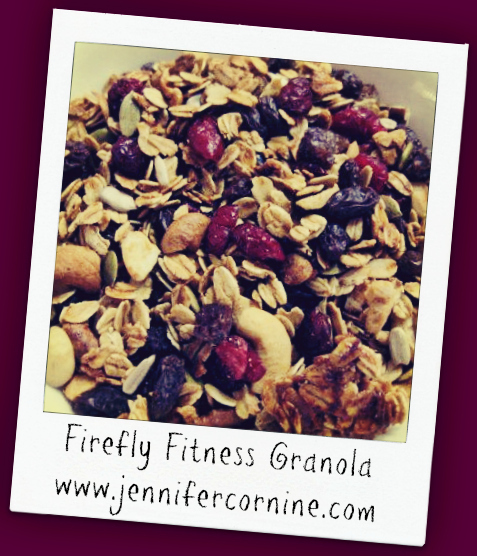 So I began mixing up baggies of what would become my now famous Firefly Fitness Granola Cereal. Famous because my students (I teach high school television production) literally LEER at my between class breakfast. I can eat it on the go and am told that it smells delicious. When high school kids covet your food, it is time to take notice! 1. Mix ingredients together and store in container. (This recipe can easily be multiplied. I make it in large batches and portion for the week. 2. Mix still frozen blueberries with milk (and keep in separate container for transport if you are on the go). 3. When ready to eat, combine and enjoy! Categories: breakfast, clean granola, fast food alternative, healthy breakfast, mood food | Tags: 21 Day Fix Extreme, Beachbody, Body Beast, Body Beast for women, Clean Eating, diet | Permalink. I have been following a different workout program that I LOVE. I don’t love the nutrition side of it though and I have been deeply conflicted about it. As a Healthy Lifestyle Coach, I PREACH “Follow the program as it was written.” Problem is that the way this one was written feels WRONG for my brain. I have a sugar addicted brain. The real deal-as in cravings that will be relentless and zap my energy and make me moody and sad and defeated kind of addicted brain- so a diet made up of 50% carbohydrates is not a healthy choice for me. So with much trepidation, I have decided to bag the carb-loading lifestyle after 3 weeks (and 4 lbs) and go back to my nutritional sweet spot (pun intended). I do plan to continue with those killer workouts and share my progress as the challenge continues. Melt coconut oil. Blend all ingredients together in a food processor or blender. Pour into paper-lined muffin tin cups or silicon muffin cups and fill half-inch full. Makes 20. Chill for 30 minutes or freeze for 10 minutes. When firm, remove. Store in a sealed container in the refrigerator. Mmm-mm! If you would like to see what I’m cooking this week, I post my recipes on my Pinterest board here.https://www.pinterest.com/JenniferCornine/this-weeks-meal/. I am following the 21 Day Fix Nutrition Guide and would love to share more with you about it. Just message me or find me on Facebook! Categories: Uncategorized | Tags: #endstigma, 21 Day Fix, 21 Day Fix Extreme, anxiety, Beachbody, Body Beast for women, Challenge Group, chemical imbalance, clean peanut butter cups, depression, Eat Clean, low carb, paleo, sugar addiction, Weight Loss | Permalink. Reblogging from The Team Beachbody Blog. When we partnered with professional bodybuilder Sagi Kalev to create a real home bodybuilding program, we were met with a lot of skepticism. “You can’t get big without an Olympic weight set,” we were told by so-called experts of the industry. We knew they were wrong, we just weren’t sure we could get the public to believe in it. At the Beachbody Classic, the proof was in the proverbial pudding; both men and women had achieved world-class results, at home, without the need for massive weights, squat racks, or even a bench press. Here’s an inside look at what the program is and how you, too, can become a Beast. In our first meeting with Kalev, the conversation revolved around how to get results without a ton of equipment. While Sagi was confident that it could happen, there was no track record of it being done. Bodybuilders, traditionally, are married to the gym. Historically, it’s been such a part of the bodybuilding psyche that no one bothered to consider it. But Beachbody’s CEO, Carl Daikeler, wasn’t so traditional. He thought only of the untapped potential of those who were too shy, or too busy, to get to the gym every day. If we could come up with an alternative, we could change the entire perception of what it takes to get big. It’s not like we didn’t have experience, either. Throughout our history we’d seen great results with limited equipment. In fact, armed with nothing but exercise bands, Daikeler had added pounds of muscle using P90X. Even though we’d never focused exclusively on bodybuilding, we’d helped thousands of people add some mass and knew our template for using minimal weight could be expanded. We also had access to Dr. Marcus Elliott and his P3 team of exercise physiologists. They transformed athletes, so movement is their specialty, but an athlete’s body must also match his or her sport. They knew all the latest science of metabolism and how to grow (or shrink) bodies for optimal performance. With a solid team in place, research commenced. Strategic meetings, test groups and some good old trial and error followed and, pretty soon, Dynamic Set Training was born. It’s long been understood that that muscular hypertrophy (growth) is based on the body’s ability to create hormonal cascades, which translates into an altered metabolism that’s more easily molded into shape. With proper structure, along with strategic eating—a lot of eating—and supplementation, you’ll maximize your body’s ability to gain muscle. Heavy resistance (a.k.a. weight) has always been a key component of this process. However, continual research has shown that while lifting maximum weight and inducing failure is a vital part of the process, one of the main factors is something referred to as time under tension. Time under tension is the cumulative amount of time that your muscles spend contracted during a workout. As long as you’re continually pushing your body to its limit, this factor supersedes the actual amount of weight you’re using. Knowing this opened the door for new weight training strategies to maximize time under tension using minimal weight. This in no way means that only light weight can be used. It’s still vital to stress the body in something called the Phosphocreatine energy system (anaerobic endurance), so you still need enough weight to continually achieve failure. However, the principles of time under tension opened the door to new forms of training, using different styles of sets and cadences that can facilitate anaerobic failure with less weight and equipment than is traditionally used. If this seems complex it’s because, well, it is. It took a crew of experienced trainers a fair amount of testing to nail it. As scientific as it is, the underlying principles of Dynamic Set Training can be simply explained using one example, called a pre-fatigue set. Pre-fatigue sets require you to do a low-weight, high-rep set of exercises that targets muscle groups, followed by a heavier set that targets the Phosphocreatine system. For example, a set of push-ups to failure, followed immediately by a set of bench press in which you use the maximum weight in order to fail at 8 to 12 reps. The first set tires out the body so you can achieve anaerobic failure in the second set with less weight than you’d normally use. This turns the entire “superset” into one very long anaerobic set, adding to the overall time under tension of the workout, thus forcing the body’s hormonal response to build muscle. Over the course of a program, you must continually force the body to adapt to training protocols. What this means is that, as great as pre-fatigue sets are, you can’t just rely on them alone to stress the body’s hypertrophy response. To accomplish this, we needed to come up with an array of training methods that would maximize time under tension, while still forcing anaerobic set failure, the result of which was a stew of different weight training strategies we called Dynamic Set Training. A training strategy does not a program make. So while Dynamic Set Training was the vehicle that allowed us to create an approach to building muscle without a literal ton of weight, it needed to be molded into a training program. Any solid training program includes an overall strategy for exercise, along with diet and supplementation that match. This being Beachbody’s forte, it was a straightforward process, but a program that targets mass is a slightly different animal than a weight loss program. The strategy for Beast had to accommodate both. The exercise protocol included setting up microcycles, which are your workout schedule for a given week; macrocycles, which are your blocks of training that maximize the adaptation principle; and recovery, so that your body has time to properly build muscle before you hit it again. For Beast we set up two schedules, one for those looking to change their body composition by either gaining or losing weight, and the other for those looking only to gain mass. Since this article concerns mass, we’ll just focus on the latter schedule. Workouts based on Dynamic Set Training are not enough for an effective program. You have to create workouts that can utilize the theory of progressive overload over time, meaning you need a strategy that stresses the body continually from the time it’s out of shape until its fitness level is peaking. This is the reason there are so many workouts in the program, as well as a training schedule that’s set up in various training blocks. Essentially, each training block is crafted so that you maximize a training principle known as the specificity of adaptation. Blocks are designed to last a month, but you may do them longer depending on how your body is adapting to your training. When you peak, you move on to the next one. Of course, as any bodybuilder knows, all of this revolves around diet (including supplementation). Most bodybuilders say that diet is the crux of bodybuilding, especially at first, as you’re attempting to add more mass than is natural for your body. Categories: Beachbody Challenge | Tags: Beachbody, Body Beast, Body Beast for women, cardiovascular health, Challenge Group, Clean Eating, Dynamic Set Training, macronutrients, microcycles, Phosphocreatine system, strength training for women, superset, Weight Loss, weight training | Permalink. The difference with our Beachbody Community is our Heart. We have Celebrity Trainers with Heart. Last night Body Beast creator Sagi Kalev and his soon-to-be bride, superstar coach Barbie Decker took time out of their vacation to get on a phone call with about 200 women to answer all of our questions about tackling Body Beast as women. When was the last time you heard of that level of accessibility (outside of the Beachbody Community?) That is why I love this company and the culture that it created. We all had SOOO many questions. Will I get bulky? How do I eat all of that food? That many (gasp) CARBS? Read on for some answers and contact me if you have any more or are interested in taking on the Beast yourself! 2. Please stop being obsessed with the number on the scale! As you build muscle, your body will tighten. pay more attention to the way you feel when you look in the mirror and how absolutely stunning you are! 3. NUTRITION NUTRITION NUTRITION!!!!!! Don’t create fears or situations in your head before you try it. It is not about calories. Calories are just a guideline. What is important is that you are “WRITING IT DOWN” and really figuring out what foods make you feel good after you eat them. Take notes after you eat to figure out which ones are working for your body and which ones aren’t. You should feel satisfied with your meals, not hungry 30 minutes later or too full. It is about your portions and WHAT you are eating. Follow the book of beast (request a new one from coach relations if you still have the old one) and TRUST the process. 4. More NUTRITION: Carbs are not bad! NO, you can’t eat bagels and waffles and expect to get results. You can get carbs from starchy veggies and other healthier options that are going to fuel your body. 5. It is NOT about losing weight but IS about losing body fat! That comes with pushing yourself in the workouts and following the correct simple nutrition. 6. PUSH YOURSELF! If you can do 10 more reps, you are not pushing hard enough. You want to be working hard during the entire workout, increasing the weights progressively. 7. More cardio is NOT needed to burn fat. The program is at a fast pace and you are going to be burning a lot of calories with it. You can do other programs with it but ensure you are eating enough food. 9. YOU GOTTA HAVE FUN WITH IT! The Beast, who has over 27 years of professional body building experience, has put together this program, taking over 2 careful years to make sure every rep, every recipe, and every part of the guide was strategically formulated to get you results. That’s why it is the number one infomercial on TV… because it works! The winners of the Beachbody Classic 2014 are those who did the Beast program and followed the meal plan to the T! Don’t over-complicate it! 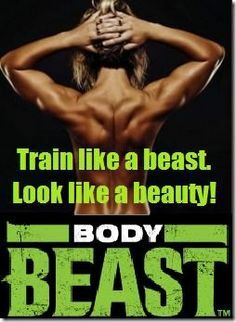 Categories: Beachbody Challenge | Tags: Beachbody, Body Beast, Body Beast for women, Cardio, Clean Eating, strength training, weight lifting women, Weight Loss, weight training | Permalink.